Peter Brown was the first to illustrate, the Mauritius Fody. He called it the Red-headed Finch and gave a description of the bird. Brown notes that the bird was in the collection of Marmaduke Tunstall, an English ornithologist and collector. The fody would have been brought by ship from Mauritius to England, where it would have been purchased by Tunstall. Tunstall kept it in captivity for several years (Fox 1827). The Red headed Finch (Brown 1776). Type specimen no longer exists; the illustration of Daubenton 1783 serves as a type. Identification. 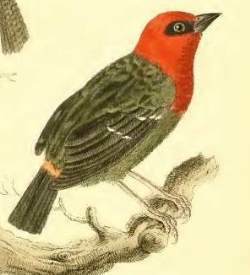 The Mauritius Fody Foudia rubra is found only on Mauritius Island and is listed as Endangered since it has an extremely small population. The male in breeding plumage has the head red or orange-red, with a black mask through the eye; the lower rump and uppertail-coverts are orange-red, and the rest of the body is olive-grey. The female and non-breeding male are dull olive-green, with a yellowish wash below. The juvenile resembles the female, except for a paler brown bill, which may be retained for its first year. 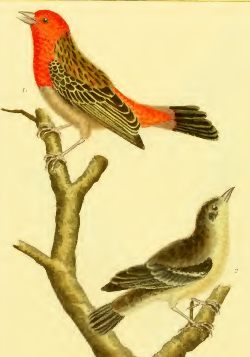 The non-breeding male, female and juvenile may be separated from the Madagascar Fody by their darker, less streaked plumage, plumper body, relatively shorter tail, and different calls. Distribution. 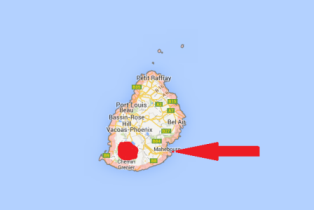 The Mauritius Fody is restricted to south-west Mauritius (see red polygon on map) where there are 3 small sub-populations. 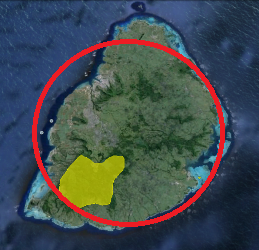 In 2005, hand reared chicks were released onto the offshore islet Ile aux Aigrettes where the species apparently occurred historically (red arrow on map, see also news). The population on Ile aux Aigrettes increased to 217 in September 2011, but declined to 165-170 birds in early 2012 (IUCN). Translocations to Round Island in 2010 and 2011 were unsuccessful, largely due to predation by Round Island boas Casarea dussumieri. 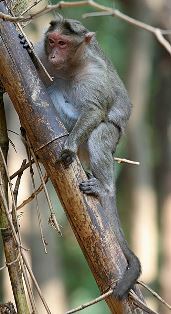 The main threats to the Mauritius Fody has been habitat destruction and the introduction of predators, such as black rats Rattus rattus and Crab-eating Macaques Macaca fascicularis. However, since 1993, the population has been stable due to conservation action, the population being about 140-170 adults and an estimated 108 pairs in 2012. It can co-exist with the introduced Madagascar Red Fody. Habitat. The Mauritius Fody inhabits remaining native forest but also survives in degraded forest that has been invaded by exotics, as well as forests of exotics such as pines. Food. 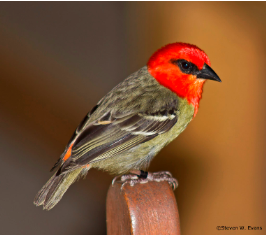 The Mauritius Fody is mainly insectivorous, and feeds on grasshoppers, beetle larvae, caterpillars, and also spiders. Berries are eaten regularly by some individuals. It feeds on nectar regularly, using its specialised brush-tipped tongue. It forages in dead leaves, and probes bark and epiphytes, and gleans from leaves, for invertebrates. It is usually found singly, in pairs or in family groups. Breeding. The Mauritius Fody is monogamous and territorial. 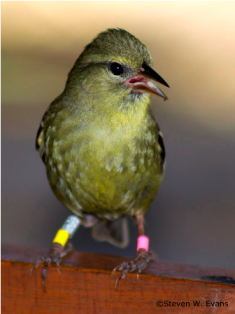 Birds may have long-term pair bonds and remain on their territories year-round. The nest is domed, with a side entrance and often with a porch. Nests are built by both sexes using grass with moss, lichens or small twigs. Nest material is gathered within 100 m of the nest. The female adds lining, mainly feathers, before egg-laying and up to 8 days into incubation. Nests may be strong, able to withstand gale force winds, but others have less secure attachments leading to active nests falling to the ground. Nests are built in trees, usually hidden in foliage. Many tree species have been recorded as nest sites, but with exotics being used increasingly since the 1970s. Some pairs habitually desert their nests, while others rarely do so. The clutch is 2-3 pale blue eggs. Incubation is by the female. Initially the female feeds the young, and later chicks are fed by both sexes. Breeding success is low, with predation being the major cause of nest loss.